Many people train without any intensity and some groups cater to that (1). There is often no “heart and soul” in training and people spend time discussing theory as opposed to sweating and doing (2). Untested and inexperienced theories – ones that have arisen without intense training – also demand recognition and validity (2). Martial arts are full of self-deceit and dogma is frequently preferred over function (4). People actively avoid comparing what they do with others and “adopting what is meritorious in the work of others” is perhaps even discouraged?(5). There are plenty of unethical marital artists out there, both publicly and privately (6). It occurs that those 5 simple rules would help make the martial arts a lot better. I wondered what your thoughts were on them and what your suggestion would be for the missing third one? It is interesting to see (read) some of the older notes or rules such as these in regards to training, as most of them seem to be advice for general life as well. Rules for training seem to be coupled with the rules for generally being decent and moral in your life. It is no wonder that currently this trend is manifesting itself into martial artist / life coaches, and other self-made guru's who feel that they should be teaching their students how to live their lives as well as train in M.A. I think that your (Iain) comments sum it up pretty nicely. Although, I don't believe you have to be intense to be serious, I do agree that you cannot be intense without being serious about your training... (well there is intensely dogmatic. Always an exception to the rule, damn). Heart and soul in training to me means aliveness- moving and doing and concerned with performance, not theory. (what's the saying? In Theory, theory and reality are the same, In Reality- they aren't.) Points #4 & #5 are very much the same about dropping Bulls*it and seeing truth. Don't lie to yourself, don't deceive others. The outstanding point here is the latter bit of #5 of adopting what is meritorious in the work of others- this is important. It's along what Bruce called, adopt what is useful. I would think there would also be a note of "add what is specifically your own [to your art]." This is why I put #3 as I did. There has to be evolution or the art is dead, and it is obvious that the masters of the past were adamant that the art was alive. the last note of be ethical in public or private- seems that I've seen a few instructors who would preach one thing and faced with a similar ethical decision in private- would not do as they preach. it is sad really, A- why they feel the need to preech as part of coaching other how to fight, and B- that they can't seem to follow their own advice. 1- be serious in training. 2- be concerned with performance, not theory. 3- be dilligent in training, and persue your own art. 4- don't have false image of self, don't impose your belief on others. 5- know where youstand honestly (in training), adopt what is useful from others. 6- be ethical, always. it matters not if you are being watched. I'd be intersted to know exactly when this was written, and if it was a precursor to the dojo kun or not. Anyone know? 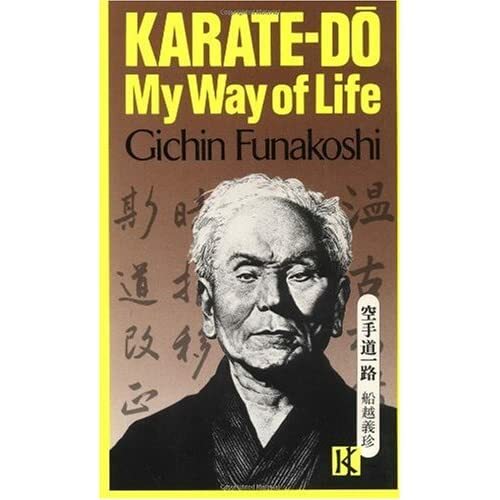 The book is dated as September 1956; six months before Funakoshi’s death in April 1957. However I have to say, that I can't completely agree with rule #2. I strongly believe in theory to understand practice, and to back up performance. It's called logic. Why else bother with the saying you 'fight' like you train? ('fight' can be substituted with other practices.) Training cognition. I must also say that theory needs to be tested to revalue it's worth. I believe this is in line with Andrew's reference to Bruce (Lee I suppose): 'adopt what is useful'. However I have to say, that I can't completely agree with rule #2. I strongly believe in theory to understand practice, and to back up performance. It's called logic. Why else bother with the saying you 'fight' like you train? ('fight' can be substituted with other practices.) Training cognition. I must also say that theory needs to be tested to revalue it's worth. i have to say that i also find it as important to learn and understand the theory side of the arts as it is the physical aspects of training. what i think Iain means in saying that too many people discuss theory instead of training is that there is an appropriate time and place for both. when at the dojo training then this should be 90-95% physical training with intensity. however study of the theoretical aspects of the martial arts should be conducted outside of the dojo. i am thinking along the lines of history, physiology, law, principles, strategy and tactics, and so on. i find it puzzling when one comes across high grades who although they may be technically proficient have little or no knowledge or true understanding of their chosen style. i also like and agree with andy's proposed third rule. it seems to me that those six rules are similar if not the same rules that are outlined in Funakoshis Karate Do Nyumon. 1. Since Karate is a martial art, you must practice with the utmost seriousness from the very beginning. 2. Try to do exactly as you are taught without complaining or quibbling. 3. When you are learning a new technique, practice it wholeheartly until you truly understand it. 4. Don't pretend to be a great master and don't try to show off your strength. 5. You must always have a deep regard for courtesty, and you must be respectful and obedient toward your seniors. 6. You must ignore the bad and adopt the good. 7. Think of everyday life as Karate training. Here is a direct translation of the Karate-Do Rokkun done by Henning Wittwer : Six Instructions for the Way of Karate (1) Karate practise has to be sincere. (2) Disregarding theory, silently plunge body and heart into practice. (3) When you learn one technique grab it by penetrating down to its bottom. (4) Don’t be conceited; don’t be proud of dogmatism. (5) Reject weak points and grab good points. (6) The common, daily private and public life is morality as well as practise.